If you have had to let go of something you care deeply about (and I am sure we all have), you know that you continue to wonder what you will have to let go of next. Can we learn to be like Job and hold loosely to the gifts God has given us? It all belongs to Him, but I am very quick to worry about what else I will have to let go of. Will I accept the promise that God can be enough? Look at the conversation between Job and the Lord in chapter 40 of Job. God began by asking Job to admit his inferiority, and naturally Job did. He lowered himself and claimed his guilt. But then God went on. "Would you indeed annul My judgment? Would you condemn Me that you may be justified? Then adorn yourself with majesty and splendor, And array yourself with glory and beauty. Disperse the rage of your wrath; Look on everyone who is proud, and humble him. Look on everyone who is proud, and bring him low; tread down on the wicked in their place. Hide them in the dust together, Bind their faces in hidden darkness. Then I will also confess to you that your own right hand can save you." Take a moment and let that sink in. When I realized what God was saying to Job I was speechless before the Lord. He is also saying it to me. If you know better for yourself than I do, then you should take over being God. Lately, I have found myself telling God what I need and what I want to happen so that I can have the life I desire. I wanted to see God do a work, and I told Him what I wanted Him to do. Essentially I was telling God that I knew better than He! I was not willing to accept the place where He has put me right now. I was trying to be God. Job 41:10 says we would be better off fighting a dinosaur or killer shark than trying to contend with God. That joy and peace and love will not come until we let go, lay it all ...ALL... on the altar and let God be God. He is leading me, and clearing the path as I go. He is my shepherd, I need to be more like the sheep and simply follow. I had to get on my knees and ask the Lord for His mercy. And from that moment on, my day took a turn and my eyes began to shift back to Him. It is awesome how the Word of God will change you if you get in it and if you let it. "When our skin is pricked by a thorn, what comes out is what's inside: blood. When our lives are pricked by difficulty, what comes out is what's inside. For some of us, it is selfishness, pride, bitterness, and anger that comes seeping out. For others, it is the fruit of the Spirit--love, joy, peace, patience, kindness, goodness, faithfulness, gentleness, and self-control (Galatians 5:22-23)." Is it really worth pulling weeds when they will just grow back anyway? Imagine if we took that attitude toward other things. The laundry. Cleaning. Cooking. Imagine how we would smell and what our house would look like. And the eating – just because we are going to get hungry again doesn’t mean we don’t eat does it? Do you decide not to shower just because you will get dirty again? The Bible says in Proverbs 4:23 “Keep thy heart with all diligence.” It did not say PUT. If you put it there you would expect it to stay. But we know the heart is wicked and it will not stay there unless we keep returning to that place…the heart of God…for our direction. We all know that pulling small weeds is much easier to do and you can get the entire root. But letting the weeds get too big makes them very difficult to pull, and often the root is so deep that it breaks off and remains in the ground. Then I don’t have to tell you what happens but I will, It grows back very quickly! For a while it can fool you, it looks nice and kept, but it does not take long for those ugly weeds to come back and cause the same problems they were causing just a few days earlier. Do you know how you are supposed to look? 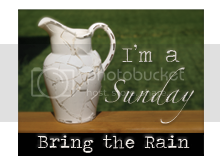 Do you put on your Sunday clothes and give the impression that you are kept, even though you just pulled the big weeds and left the roots down deep? Because God can see the down deep part, you can fool those around you but you cannot fool God. And isn’t He the only one who matters? It is amazing to me how much we hide when God sees it all, we do not take seriously the fact that He, HE, HE is the only one we should be trying to please and He can see all of me!!! I can see it in my own life. When I stay in the Word of God and keep going back to His promises, His instructions to me, His way of doing things then I can make changes. Changes that will last. I have to get to the roots, and get rid of the problems before those changes will start to take permanence in my life. And it will probably never be permanent. Even after we get the roots, when the new season rolls around there are always new weeds, new problems. But if we keep them pulled, they don’t grow so easily, and they aren’t so hard to pull. Keep yourself in God’s Word, stay close to Him. So when the problems start to arise you are ready to face them and they aren’t so hard to overcome. Am I letting myself think more about what I don’t have than what I do have? Mainly Jesus? I need nothing else. Yet I continually find myself being discontent. Not even about material things. It may even be “justified discontentment” if there is such a thing. What I mean is, what I long for is the life God also longs for me to have, but for some reason God is allowing it to be different. But I know in God’s Word that I am to choose contentment…. I had been about ten years since the Philippian church had been able to help Paul financially, even though their desire was to help him more. Yet in the midst of his need Paul chose to be satisfied, self-sufficient. God knows what I need. He knew I needed it before I realized it. But am I satisfied? Sometimes not. How about our material needs and desires? God will supply them to us too! And He will lavish them on us if we first give without holding back. What could you and I gain if we choose to be content in the Lord? We meet with the geneticist on Aug 24 to see if she has any of the three genetic conditions that cause lissencephaly. If they are inconclusive they will order more blood tests. On September 17 we'll meet with the neurologist again, not sure what we will do at that appointment but he mentioned that around 9 months (November-ish) they'll order another MRI and EEG. Layla is rolling over from tummy to back and is on the verge of rolling from back to tummy. This weekend (Aug 21) we met Cari and Christopher. Christopher is 9 and has ILS (a type of lissencephaly). He is an amazing kid! Our first interaction face to face with another liss kid. Please continue to pray for Layla's development and no seizures. She is doing magnificent and mommy and daddy feel truly blessed. Join her Facebook Page to read more. There will be a celebration service Sunday at 6:30pm at Fountain City Wesleyan Church in the Richmond, Indiana area. Please bring your favorite childrens book to be donated to the Cincinnati Children's Hospital in memory of Tressel. Funeral services in Findlay are pending. Many of you may not know that after my C-section in May I ended up with a nasty DVT in my left leg (blood clot in the main artery of my leg). I was put on blood thinners and told it should be back to normal in about 3 months. About two weeks ago I had another ultrasound and found out that it is not going away and was sent to see a surgeon. Today I saw the surgeon and found out for sure that the vein is permanently damaged so I will have issues with it for the rest of my life. Perhaps a clot that will not completely dissolve. It will swell when I am exercising or on my feet more, and will cause risks with future surgeries or medications. I don't know if I will ever get an answer to my hundreds of "Whys" but I do know the One who has the answers, and I also know He still has a plan for me. The more God gives me to deal with, the more of His Amazing Grace I will have the privilege of experiencing! ...Another tough pill to swallow. Lord soon. She and Scott need your support during very difficult time. We have learned that God answers all our prayers, sometimes in ways we do not want to have them answered. This little guy was just as much a miracle as those who have gotten the answers we ask for. 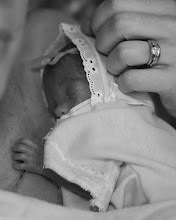 Pray for this family and for the lives that such a tiny life will touch -- and has already touched! We don't know how God might use this situation, but we do know that he uses them all for His Glory! Because she won't want to be a princess forever! Yes, it takes a lot of patience sometimes, but I do my best to let Ella help. She was actually a big help today! 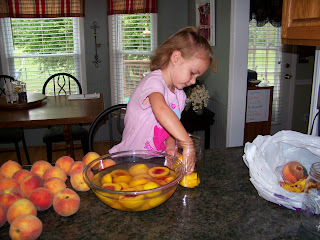 She filled almost every jar with the peach halves. Put 3 or 4 tablets of vitamin C in a bowl of water and dissolve. 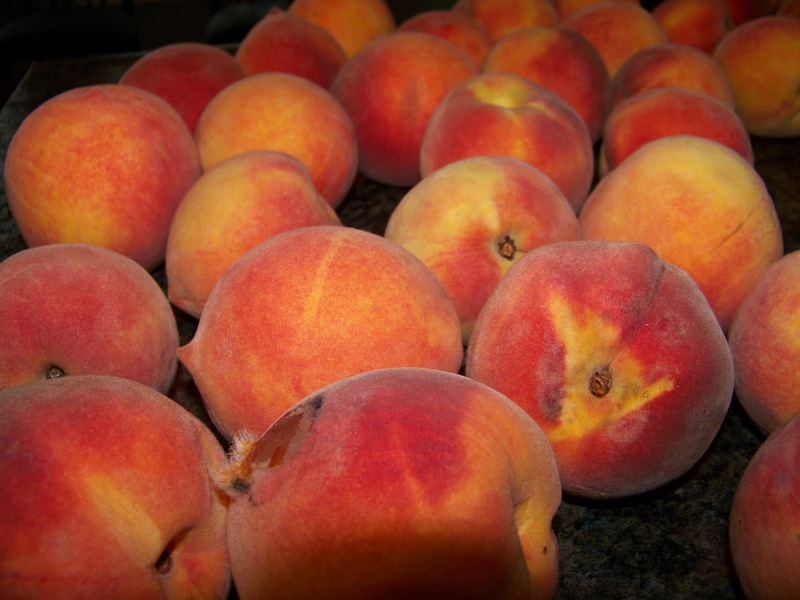 Cut peaches in half, remove seed and peel. 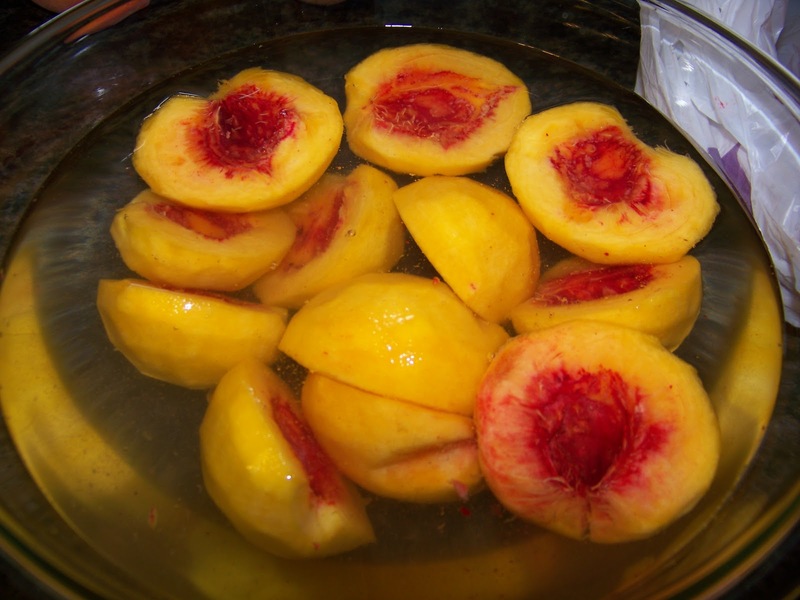 Place in the bowl of water to prevent fruit from turning brown. Mix 3 cups of water and 1/2 cup of sugar, heat in microwave until hot and sugar has dissolved. The light syrup recipe calls for 1 cup of sugar to 3 cups of water, but I even cut it in half and it has always been plenty sweet for us. Medium is 1c sugar to 2c water, Heavy is equal parts water and sugar. 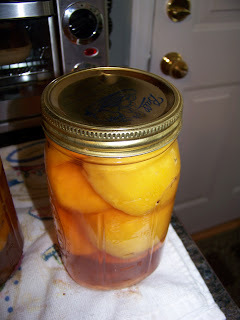 When you have enough peaches to fill a jar, place them cut side down in the jar, and then pour syrup over peaches to 1/4 inch from the top of the jar. 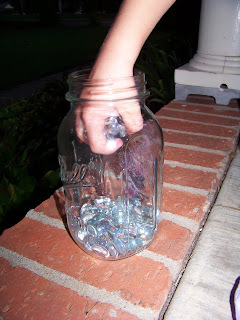 Place lids in boiling water for 3 minutes, then screw them on jars and place in canner. Pressure can for 8 minutes at 5 pounds of pressure, or Hot Water Bath for 25 minutes. Has anyone had this happen to their lids? They pushed out so much that there is a dent in the top. I think they still sealed, but I am wondering if there was a way to prevent this. I'm preserving this week! Every year on our trip to Chad's parents we like to stop at the Apple Barn in Hendersonville, NC to get apples and peaches! They sell their 1/2 bushel bags of apples (the 2nd's) for $4.00 each!!! 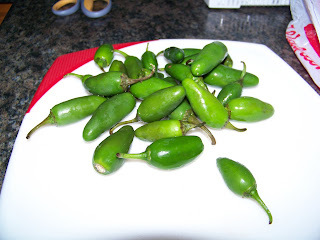 I also had jalapeño peppers in the refrigerator that were ready to be used up, so the week started off with those. 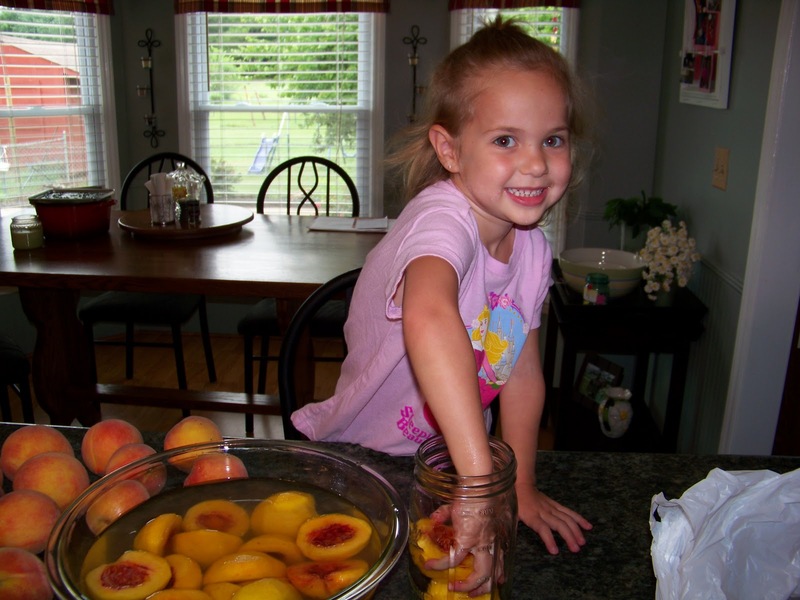 We preserve foods so we can keep and use them over long periods of time. Just as the Word of God has been preserved for us down through the ages. 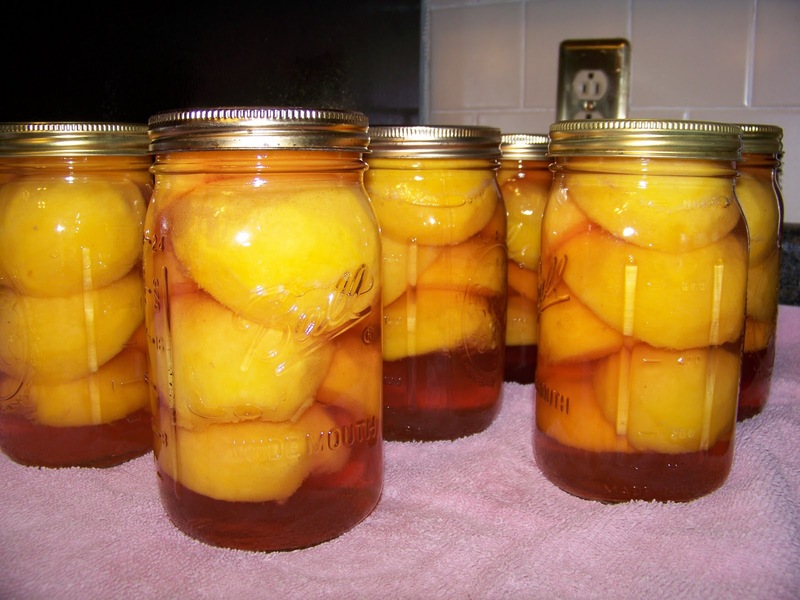 Later this year we will enjoy peaches, applesauce, apple butter, hot mustard relish, and lots more because I spent the time preparing and preserving them. Do you take the time to enjoy the Word that was preserved for us? Because the benefits reaped from it far outweigh the delicious foods we will enjoy in the months ahead. Get in the Word, He wrote it for you and me! Note: You might want to wear gloves when chopping the peppers because they will irritate sensitive skin and will burn your eyes or tongue if you touch them later, yes even after washing your hands. Add the rest of the ingredients to the peppers in a large pot. 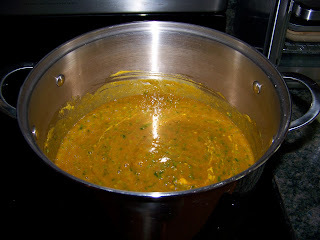 Bring to a boil over medium-high heat and cook (slow boil) for 20 minutes. 2. In a separate bowl, mix 1/2 cup flour and 1/2 cup water and stir until you have a smooth paste. Add slowly to the pepper mixture, stirring constantly. Cook for 5 minutes, continuing to stir constantly to prevent relish from burning. Makes 6 pints. 3. Can the relish in hot jars and lids. Place in the canner of hot water until the water is an inch above jars. Put lid on loosely, and hot water bath for 10 minutes. 4. 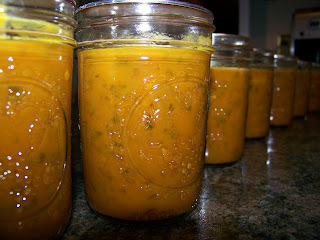 Remove from canner and place on towel to cool completely. Do not pick up or touch jars for 24 hours, or until they are completely cooled. 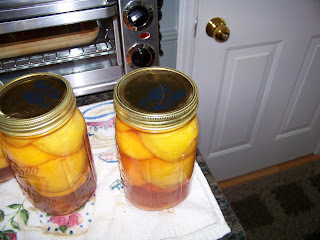 Remove rings, wash jars, and it is ready to use. Would you like to try a jar of the relish? I will be more than happy to send a jar to one of you! The drawing will end at midnight, Wednesday August 25, 2010. I will not share any names because I have not been able to speak to the family yet. 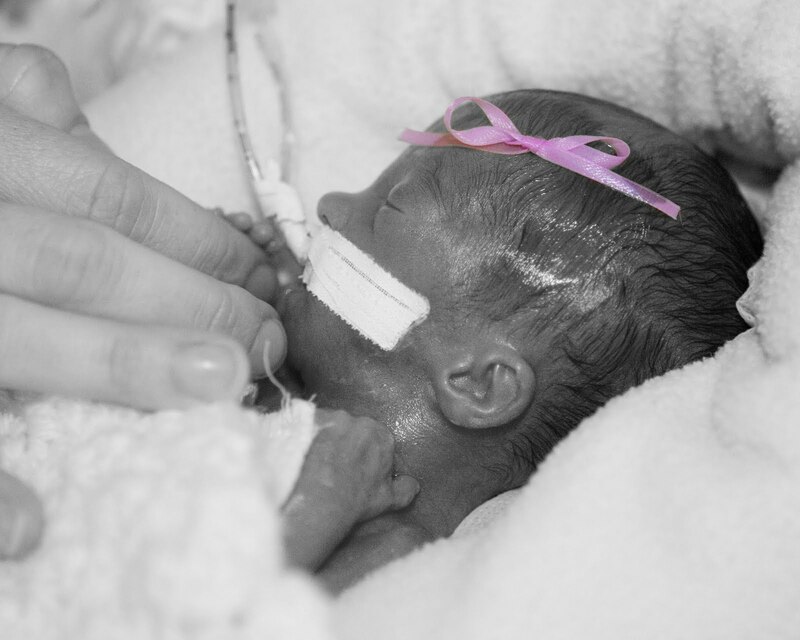 But please keep in your prayers a family who yesterday buried their 21-month daughter. She got into the backyard and drowned in the pool. As far as I know, this family does not know Christ and I simply cannot imagine a tragedy without Him by my side. Pray as I get in touch with them that they will see Christ in me, and someday I can introduce them to the One who now cares for their baby girl! Occasionally we run into acquaintances and Ella knows as well as we do that they do not know about Audrey. Often Ella will say, "I want to show them Audrey in your necklace!" So she does, then she tells them that Audrey died or that she is in heaven, and then there is silence. Don't feel like you need to be silent! If we did not want to talk about our child who died, then our children who are still here with us would have already picked up on that and would not mention it either. I do realize there are people who put everything away and do not want to talk. But most of the people I have met are not this way. Audrey means just as much to me as Ella and I will not ~ and could not ~ ever stop thinking or talking about her. 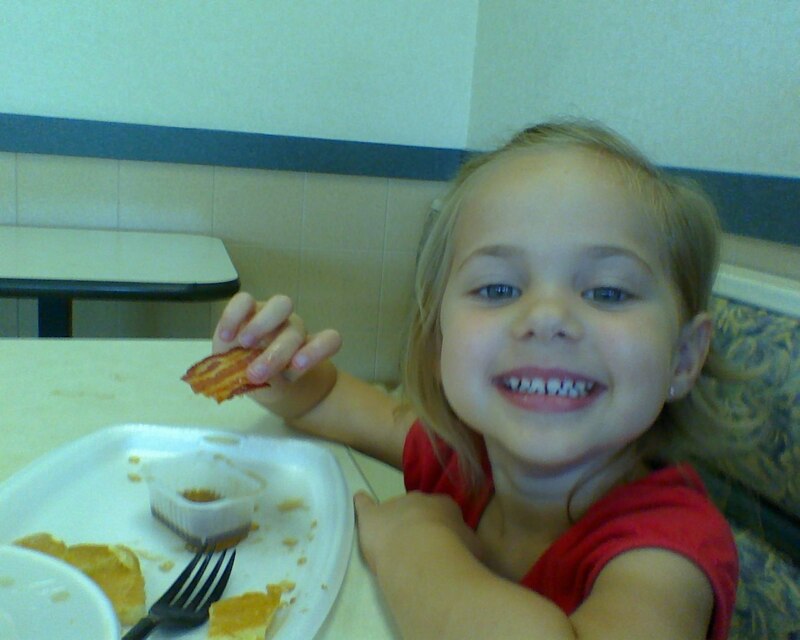 Talking about her will not make me more sad or make me think about her any more than I already am-- if you have a child you can understand because they are on your mind all the time. For us death is sad, for the one who went to be with Jesus death is wonderful. More wonderful than any of us on earth could ever comprehend. My daughter has to be the most thought-provoking child I've ever met. She says things out of the blue that tend to catch me off guard, but I am glad for it! This weekend the 3 of us are all going in different directions. It is hard...I want my family together because now what I think about a lot is that us being together can change all too quickly. Ella and I went out for a special breakfast at McDonald's today -- we love their hotcakes! Then we went to visit Audrey's grave and on the way there her mind must have been working overtime! She started out by asking why Audrey had white stuff on her face (she was talking about at the funeral). I explained that to her, and we talked about how pretty she was before she died and how she looked much better in the hospital. "Audrey can't wait to see you, Mommy. And her eyes will be open really big." It blessed my heart....more than I could ever explain! Then we went into a discussion about God, and if God is at Taylor's house then He can't be at ours too. So I was able to explain a little about how God can be with us all...all the time! And that we can't be in two places at one time, but that He can. It was a great reminder to me that this weekend, although we are apart, God is with each one of us. He is the protector of us and I have to trust Him to keep us in His care however it is that He sees fit. It's hard to say that, knowing that keeping Audrey in His care meant taking her to the safest place she could ever be -- while taking her away from me for a time. "I hope there is no poison ivy on my baby." She is one of the main reasons I am doing OK.
in our home. It was still a challenge to remember that truth each day. Why Don't I Just Give Up on God? This struggle has had me asking "Why?" more than any other thing I have experienced in my life, and I often wonder why I have been able to stay faithful to the Lord. That is not to say I have done perfectly. But I have found His promises to be more real and more true to me than ever before, and I know He has a purpose in all of this. I hope I see some of the purpose unfolding as I continue my life here on Earth. In fact, I have seen it already simply in the way He has drawn me closer to Him in the past 3 months. I still have a long way to go, but I hope I continue in that direction! I want to share something with you that had great meaning to me. It is from Erwin W. Lutzer's book One Minute After You Die. The death of an infant causes all of us to struggle with the will and purpose of God. It seems strange that God would grant the gift of life and then cause it to be snuffed out before it could blossom into a stage of usefulness. But we can be sure that there is a purpose in such a life, even if it is not immediately discernable. James Vernon McGee again says that when a shepherd seeks to lead his sheep to better grass up the winding, thorny mountain paths, he often finds that the sheep will not follow him. They fear the unknown ridges and the sharp rocks. The shepherd will then reach into the flock and take a little lamb on one arm and another on his other arm. Then he starts up the precipitous pathway. Soon the two mother sheep begin to follow, and afterward the entire flock. Thus they ascent the tortuous path to greener pastures. So it is with the Good Shepherd. Sometimes He reaches into the flock and takes a lamb to Himself. He uses the experience to leave His people, to lift them to new heights of commitment as they follow the little lamb all the way home. Rev 1:17-18 God has the key to my child! So you see, the reason I keep following God? He has my baby girl! Remember Who this is all about! "What are people thinking of you?" Is God using you? Are you letting Him use you? Wonderful! We all struggle with this, we want praise and admiration for what we accomplish. After all, life is hard work! But are we truly doing what we do so that it will bring glory to the One and true God, or are we doing it so that people will notice? I hope they do see you striving to please the Lord, and as a result have a desire to follow Him whole-heartedly as well. But just maybe...and this is just a thought...maybe we should not hear as much about how we have influenced people and more about how God is being lifted up. What have you done recently that nobody else saw except the Lord? I must go and examine my own heart. What a Day of Blessings!!! My heart is going in so many directions as so many events of today are unfolding!!! Our sweet little nephew, Tyler, was safely delivered and is doing well. Audrey is enjoying the pleasures of heaven, of which I cannot even fathom. Another friend is remembering having to say good-bye to her baby 4 years ago, but also looking to the hope of seeing him again. God is Good. Whether it brings us joy or sadness. I Need to Talk to Someone!!! It seems like I say this a lot. What do you do when you are feeling this way? I cannot say I do this every time, but lately when I feel this way I go to the Lord. Maybe it is because I cannot express what I am feeling with much articulation. And He already knows. Plus I know the encouragement I find when I go to His Word and am reminded of His promises to us. Nothing in this world will every satisfy my aching soul the way the Word of God does. And I am so thankful that He is where I have turned during some of the darkest days of my life. I hope and pray I will continue to do this until He returns for us. I know we need each other, the body of Christ that is, to encourage and hold one another up. But I also know how difficult it can be to keep my words in check. When I go to someone else there is the chance I will say something I shouldn't. Let's admit, it is easy to do. Especially if we are having a rough day and need to "vent" (that is often a sugar-coated way to say complain). Find that person you can go to who will encourage you in the things of the Lord. Shortly after Audrey died, a good friend told me something I will never forget. I had already been trying my best to keep up communication with the Lord, even when I did not know what to say or how I would get through. But she told me that when she was facing some of her most excruciating days, she would just ask God "Why?" Even if she could say nothing else but "Why?" she said it to Him. Because then she was still talking to God, and He already knows what we are thinking anyway. So why try to keep it from Him? To those who put their trust in Him. So go to Him. Cry out to Him, but never stop talking to Him.